1. 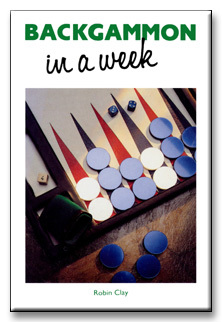 MondayBeginners Only: Learning how to move, how to play and the rules of backgammon. 2. TuesdayBasic Strategy: Opening moves, responses to the opening move, creating a winning game plan. 3. WednesdayTraps, Ambushes & Blockades: And other secrets that bring victory. 4. ThursdayRun For Your Life: Winning end game strategy. 5. FridayIt All Goes Wrong! : How to win from an adverse situation, the backgame. 6. SaturdayThe Diabolical Doubling Cube: How to use it, when to drop and when to accept. COVER: Backgammon, like chess, has been played for thousands of years, yet its appeal and fascination, with its combination of skill and luck, still attracts new players all over the world. So simple to learn that beginners can play a fun game in half an hour, but so complex that brilliant mathematicians aided by computers cannot resolve the problems of tactics and positions that arise. In a step-by-step format, Backgammon in a Week guides the beginner through the basic rules and principles of the game to a high playing standard. The book explores winning and defensive strategies, and the traps, ambushes and blockades that make the game so exciting. it is also one of the few books that covers the modern tactics and position analysis that have developed over the last fifteen years. Instruction for the Chouette version of the game, which can be enjoyed by up to six people, are included too. AUTHOR: Robin Clay is an experienced backgammon player. He has played the game for thirty years, is the author of books and articles on the subject and regularly competes in major backgammon tournaments all over Europe which keep him up to date with the latest advances and techniques. POSTSCRIPT: Robin Clay died in November 2000. Here is an obituary written by Michael Crane.